Hang onto your handlebars!!! Are you ready for a spring of biking fun at Longstone School? Over the coming months we have some great biking events to get you in the mood for that weekend bike ride along the trail! Longstone win 11th Place in the Big Pedal Challenge ! Greg Thomas Active travel officer from Sustrans helped us organise a cycle to school challenge on the 18th and 19th March with a big Superhero cycle to conclude on the 20th March . We had a fantastic 62.88% of our pupils turn out at 8am to cycle from Hassop Station Cafe along the Monsal trail to arrive bright and early at school. A fantastic turnout of 58 staff and parents along with 83 children was a sight to behold. The fact that we returned safely to school to watch the eclipse made this a very memorable day indeed. Doctor Bike will be in school all day. 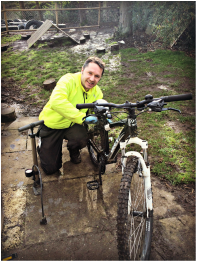 He will be able to give your bikes a quick health check and repair minor repairs such as flat tyres, brakes and loose nuts and bolts to get you back on your bike again. Sign up with Mrs Gaywood the day before, then bring your bike to school in the morning. You can pick it up at home time all repaired and ready for action. There are 20 doctor's appointments for children in Classes 4 and 5. Please label your bike with your name and a short note addressed to Dr. Bike as to why it may be “poorly”. Class 4 will be taking part in a freestyle poetry workshop with Greg and then going on a bike ride to perform at various points along the route. Parents are welcome to join us for the ride. Reception, Year 1 and Year 2 will be invited to decorate their bikes with wild and fanciful arts and crafts supplies. There will follow a grand bike parade. Certificates will be awarded for the blingiest bikes. Right in the middle of SATs week, Year 6 will be given an afternoon treat including having a go at playing polo on a bike instead of a horse! We will also be setting up the ultimate cycling obstacle course! Class 3 will take part in a freestyle poetry workshop and then small groups will perform at various points along the Monsal Trail in the afternoon. Parents welcome to join for the bike ride or walk on the trail. And finally...! There will be surprising events taking place at this year's sports day on 9th July.